Gaynor was first elected Chair in 2017, having been an active member of the NOAH Board since 2011, and its Vice-Chair since 2013. She started her career in animal health as NOAH’s Technical Executive in 1990. She has been head of Elanco Animal Health UK and Ireland since January 2015. Speaking at the NOAH Members’ Day, which followed the AGM, she outlined NOAH’s proposed new Strategic Framework for 2018-23. “While our association has achieved much, we live in rapidly changing times and it is right to keep our focus and activities under review. The NOAH Board undertook a strategic Review of our association in March that looked at its vision, values and purpose and prioritised the key areas where NOAH should focus its work. “Clearly in the short to mid-term, Brexit s a top priority with NOAH working to support business continuity and opportunity through and post EU Exit. 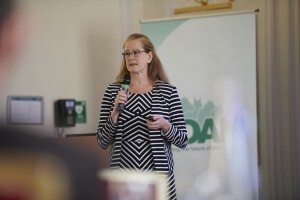 Our regulatory focus remains as important as ever, as does our work on One Health topics, ensuring appropriate access and responsible use of medicines for all animals,” she said. She explained: “We will work on delivering for our members, current and future, to provide relevant services to our current and broadening membership in the face of a changing market landscape and we will capitalise on our position as the voice of our industry to promote the benefits of our sector to society and to help create a climate where our member businesses can succeed”. She invited members to discuss the proposals and to feed back their views. The new NOAH Strategic Framework 2018-23 will be finalised at the next NOAH Board meeting in July. Role: Elanco Animal Health, UK & Ireland Affiliate Director and EMEA D&I lead. Qualifications: Degree in Applied Biology and post graduate diploma in Marketing. Synopsis of Career: After a few years in research her animal health career started in 1990 when she joined NOAH as Technical Executive. Started with Intervet in 1994 and held various marketing and BU head roles. Global Marketing head for Intervet from 2006-2008, based in the Netherlands. Joined Novartis in the US in 2008 as VP Marketing before relocating back to the UK to head up Novartis Animal Health (NAH) UK and Irish business.